Kawangkoan Japanese Cave is located in a side street between the Kiawa village and Kawangkoan city. This cave was built by the Japanese army during World War II for the storage of food and armor, communication place and consolidation during war. This cave is easy to reach from Manado (45 km). Built during Japanese colonial period, precisely in 1943, the construction of this cave takes about a year, so it began to be used in 1944. 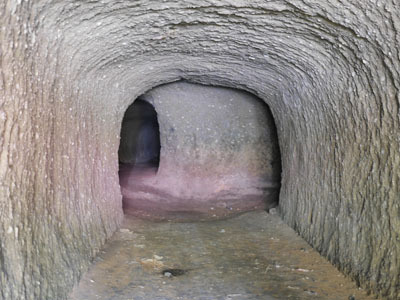 This cave has hallways that connect with multiple locations in the village of Kiawa. The halls are made in some sizes, and there were initial survey, and it adapted by the customs of Japan. At each meeting the hallway door, it was guarded by Japanese soldiers. The halls are linked together up to a few strategic places around the Village area of Kiawa. These places are: in the west Kiawa village, which is used as a place to store supplies or called as "los" and led by Nagau-ito. In the northern village of Kiawa, was served as a place to store the oil and war vehicles and it led by Iwamoto-Ka Tosoi. And in the east Kiawa village was used as a place to store weapons and ammunition, and was led by Madjidju Ki Harada. Kawangkoan Japanese Cave was made by forced labor (romusha) from Minahasa and surrounding areas. This cave has four entrances that were used during the last round of the World War II until the allies landed and Japan capitulated in 1945.